With 3 deliveries left, CSK needed eight runs to win against Rajasthan Royals on Thursday, and Mitchell Santner was on strike. On the fourth delivery, Stokes attempted a slower ball, but it turned into a full-toss and was immediately called a no-ball by umpire Ulhas Gandhe. The last over of the match between Chennai Super Kings and Rajasthan Royals, on Thursday, turned out to be the most entertaining, thrilling and controversial last-over finish of IPL 2019. Chennai Super Kings needed 18 runs off the last over, and Ben Stokes was given the responsibility by RR captain Ajinkya Rahane, to defend their total. Ravindra Jadeja faced the first ball and smashed it for a six. The second delivery was a no-ball, and Jadeja managed to take a single. On the free-hit, Dhoni muscled the ball towards a fielder and made 2 runs. Ben Stokes was under a lot of pressure, and CSK were looking like the favourites. But, Stokes came back well and bowled an excellent Yorker to dismiss Dhoni, on the third ball. The big wicket of MS Dhoni shifted the momentum of the game in favour of Rajasthan Royals. With 3 deliveries left, CSK needed eight runs to win, and Mitchell Santner was on strike. On the fourth delivery, Stokes attempted a slower ball, but it turned into a full-toss and was immediately called a no-ball by umpire Ulhas Gandhe. Santner and Jadeja managed to score a quick two runs but Bruce Oxenford, the umpire at square leg, overruled the original decision and passed it as a legal delivery. This drew a furious response from CSK and Dhoni came charging towards the pitch and was pictured gesticulating angrily. It was a very rare sight for fans as MS Dhoni is generally calm and composed. Ben Stokes tried to calm him down, but the CSK captain was adamant and got involved in an animated tussle with the umpires. However, Bruce Oxenford was firm in his decision, and it was finally given in favour of Rajasthan Royals: it was not a no-ball. But, much to the delight of Chennai fans, Santner smashed the last ball of the match for a six and helped CSK register yet another win and reach the top of the points table. It was a very entertaining game to watch as both the teams gave their best. There were a few good performances from both sides, but the match will be remembered for the following incidents featuring MS Dhoni. MS Dhoni became the first captain to win 100 IPL matches. Dhoni has been captain in 166 IPL matches (152 for CSK, 14 for Rising Pune Supergiants), and won 95 matches as CSK skipper and five matches as captain of Rising Pune Supergiants in 2016. The CSK skipper was fined 50% of his match fees for violating the IPL Code of Conduct. MS Dhoni is one of the most loved and respected players in the world and fans across the world don’t expect such behaviour from him. 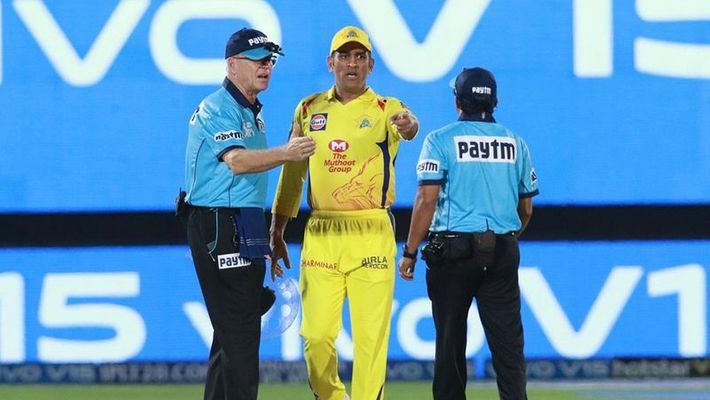 It is true that umpiring standards have been below par in IPL 2019, but Dhoni set a very wrong precedent by walking onto the pitch and confronting umpires. It is something, he will realise, he shouldn't have done. DRS is also known as the ‘Dhoni Review System’ because MS Dhoni very rarely makes mistakes and even Virat Kohli goes by his word when it comes to seeking reviews. However, Deepak Chahar surprised one and all by convincing MS Dhoni to take DRS when the CSK captain wasn’t too sure about it. It happened in the third over of the match when Ajinkya Rahane missed an attempted flick. The ball hit his pad, there was a huge appeal, but umpire Bruce Oxenford gave it not-out. Chahar immediately ran towards Dhoni and tried to convince him that he has got his man. Dhoni smiled and gestured that it might have missed the stumps. However, he paused for a couple of seconds, and asked Chahar, “Sure?" He then asked for a review and consequently, the third umpire gave it out.